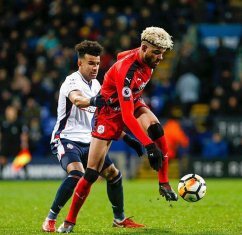 Philip Billing will not make his sixteenth successive start in this season's Premier League when Huddersfield Town travel to the Emirates to face an in-form Arsenal side on Saturday. It is confirmed that the central midfielder will miss the upcoming weekend action as a result of accumulated yellow cards. Billing acquired his fifth yellow card of the season in the Terriers 2-1 loss at Bournemouth, which triggered an automatic one-match ban. The central midfielder received his first booking of the season against Manchester City on August 19, before he was shown yellow cards against Everton, Tottenham Hotspur and Watford. Leicester City pair Wilfred Ndidi and Kelechi Iheanacho, Arsenal's Alex Iwobi, Chelsea's Victor Moses, Watford's Isaac Success are all available for selection for the next round of matches. Meanwhile, Tolaji Bola is not free to play for Arsenal U23s in tomorrow's Premier League 2 clash against Liverpool as he is serving a one-match suspension. The left-back picked up his fifth yellow card for the Gunners against Derby County on November 26.